North Korea’s New Long-Range Missile: Fact or Fiction? North Korea’s unveiling of a new long-range missile in its April 15 parade, designated the KN-08 by Western experts, has caused a great deal of speculation. Some analysts have even concluded that the weapons on display were not real. The paraded missiles are certainly not weapons ready for launching. But I believe they are probably part of a developmental process that will culminate in either a new North Korean intermediate range ballistic missile (IRBM) or, depending on the weight of its warhead, an intercontinental ballistic missile (ICBM). Moreover, the missile’s transporter-erector-launcher (TEL), probably manufactured in China in 2010, was purchased and extensively modified specifically for the new missile, not just for show. The big surprise coming out of the centennial parade was the display of six road mobile missiles, designated the KN-08. These missiles were unlike any of the DPRK’s three other mobile ballistic missile systems. Moreover, they did not resemble the recently launched Unha rocket or the reported large rocket seen at a North Korean research and development facility a week earlier. KN-08 missiles makes it difficult to measure the missile’s diameter, the dimensions of the TEL, along with the ground photos of the missile, can be used to get a fairly accurate assessment. Figure 1. The KN-08 missile displayed in the parade. Figure 2. 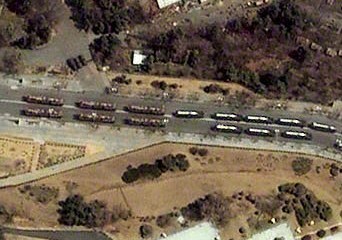 KN-08 and Musudan missiles on the parade route prior to entry into Kim Il Sung Square. While some have concluded that the KN-08 missiles that were on display were “mock-ups,” my conclusion is that they are instead, part of a developmental process intended to produce operational weapons using proven high-energy liquid fueled SS-N-6 technology obtained from Russia in the late 1990s. The first stage is approximately the same length and diameter as North Korea’s Musudan (BM-25) rocket (minus the warhead), first revealed to the West in October 2010 during celebrations for the 65th anniversary of the Korean Workers’ Party. The DPRK is believed to have modified the SS-N-6, by adding about one meter to the fuel and oxidizer tanks in order to increase the Musudan’s range. This increased the missile’s length to 9.65 meters, which is close to the measured length of the first stage of the KN-08. The KN-08’s second stage is a bit of a mystery. No rocket engine that measures 4.5 meters long and 1.5 meters in diameter has been identified in the DPRK to date. However, the fact that the second stage is 1.5 meters in diameter and appears to use liquid fuel means that the KN-08 engine may also have been derived from the SS-N-6. The missile’s third stage is 1.25 meters in diameter and 2.75 meters in length, very close to the size of the Unha rocket’s third stage that uses the vernier engines from the SS-N-6. While the North has not had much success testing this stage, a similar stage for the Iranian Safir Space Launch Vehicle has worked three times to date. While some analysts have also concluded that the missile’s warhead—about 2.5 meters long and tapered—is fake, it actually resembles that found on the Nodong-A medium range missile already fielded by the North. Even if it is not an operational weapon, the real warhead will likely be about the same length and diameter. This conclusion is based on the dimensions and shape of the transporter’s erection arms and its front brush guard. The erection arms run parallel with the missile’s sides and are attached to the clamp that holds the missile in place when traveling. The brush guard provides protection to the warhead during off-road operations and outlines its shape. There are other considerations that point to the displayed missiles as part of a process to develop a new weapon. For example, the serial numbers painted on the side of each missile indicate that the missiles come from two production series. The small differences in those missiles indicate that flaws may have been discovered and improvements made, indicating an ongoing process of development. Also, the KN-08 TEL was real and clearly specifically designed for this missile, representing a significant investment of time, effort, and money. Finally, while analysts who believe the missile was fake have argued that the KN-08, if liquid fueled, would not suitable for a land mobile launcher, they neglect the fact that the North already has an operational liquid fueled missile: the Nodong-B, which is 17 meters long, only a few meters shorter than the KN-08. In summary, the KN-08 missiles observed in the April 15th parade may, in fact, be part of a developmental process for fielding a new three stage liquid fueled missile with a longer-range than the Musudan. Whether it will eventually be able to achieve the 10,000 km range of an ICBM is to be seen. That will depend, not just on further developments in DPRK missile technology, but also on the weight of the warhead that it will carry and, particular, whether or not the North will be able to reduce that weight through miniaturization of a nuclear payload. The KN-08’s TEL is an 8 axle short cab version of the Chinese WS 51200 vehicle, probably purchased about the time it was first advertized in 2010, and produced by the Hubei Sanjiang Space Wanshan Special Vehicle Co. Ltd. Interestingly, the company also controls a joint venture with the Minsk Plant of Wheeled Carriers in Belarus, which produces the MAZ series of heavy vehicles. The Chinese vehicle has a lot in common with that vehicle, used as the TEL for a Russian ICBM, the SS-27 Topal, first deployed in 2006. 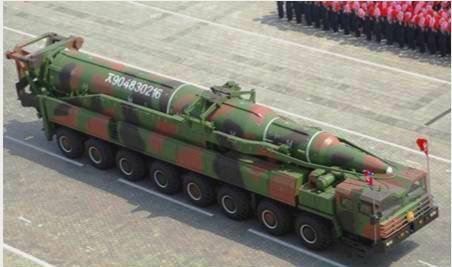 The WS 51200, the largest vehicle of its type produced in China, has yet to appear as a TEL for a Chinese missile. The vehicle comes in two versions—identified as short and long cabs—that have slightly different wheel base patterns. The DPRK uses the short cab version for the KN-08. The following table gives the relevant data for the WS 51200 and for comparison its counterpart that is used as the basis for the Russian ICBM. 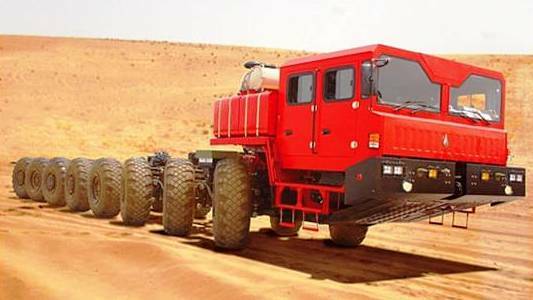 With a load weight of 122 tons, this vehicle is oversized for the KN-08 missile and the erection and launching equipment, which are estimated to weigh only 45 to 50 tons. It is unknown how many of these vehicles the DPRK purchased beyond the six shown in the parade. Figure 3. Advertisement for the WS 51200 super heavy load vehicle. Conversion of this vehicle into a missile TEL required extensive modifications that probably were undertaken by the DPRK after purchase, which North Korea has done in the past. For example, the North acquired an unknown number of demilitarized Soviet SS-20 IRBM TELs from Belarus/Russia for use with the Musudan in the early 2000s. The North Koreans installed their own erection and launching equipment, although it is obvious the vehicle was not a perfect fit. The Musudan’s 12 meter length only takes up about three quarters of the 17 meter TEL. Plus the missile is offset 0.6 meters to the passenger side of the centerline, probably to accommodate the erection hydraulics. With the bare bones Chinese vehicle acquired for the KN-08, the DPRK was able to design equipment to better fit the new missile system, which they did. The TEL shown in figure 4 was designed to carry a missile of the KN-08’s size and shape. The figure shows some of the larger additions needed to launch the KN-08 missile. By far, the biggest modification is the installation of the hydraulics required to raise and lower the weapon. The two visible parts of this equipment are the arms that run alongside the missile (the rear arrow) and the holding down mechanism shown in the red box on the top of the missile. At the end of the missile and attached to these arms is the launch platform (not shown). This entire system raises the missile to the vertical position where it rests vertically on the launch platform, then releases the missile and retracts back on the vehicle in a horizontal position. There are a number of other modifications as well. For example, the storage boxes on both sides of the vehicle (the long red rectangular box in the picture) will probably be used during transit to store equipment needed to support the troops, as well as to operate and maintain the system when it is deployed. A communications mount has been added on the passenger side roof of the cab for an antenna that will provide command and control of the missile system. Finally, there are almost certainly other subsystems not visible in the ground photos that had to be added to the vehicle to turn it into a mobile missile launcher. Figure 4. Side view of the KN-08 TEL showing some of the modifications required converting the WS 51200 into TEL. In summary, North Korea’s purchase and modification of these vehicles to serve as TELs for the KN-08 indicates a significant commitment of resources that would not have been made if the program was fake. That reality, combined with analysis of the missile itself—as well as available information on other North Korean rocket programs based on the former Soviet SS-N-6—leads me to conclude that the KN-08 is intended to serve as the basis for a future intermediate or intercontinental range missile that could carry a nuclear warhead. Markus Schiller and Robert H. Schmucker, “A Dog and Pony Show, North Korea’s New ICBM,” April 18, 2012, http://lewis.armscontrolwonk.com/files/2012/04/KN-08_Analysis_Schiller_Schmucker.pdf. Analysis by Frank Pabian, Stanford University, Center International Studies and Cooperation, April 23, 2012.